Things God Hates Or Detests. In the Book of Proverbs, we are told of types of people and actions that God hates or detests. Let the following be your guidelines of what not to be or do! 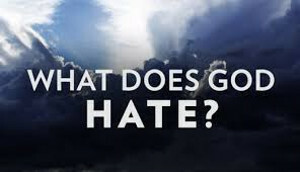 CONTINUE READING: Things God Hates Or Detests. This is a great list to remember what God hates and detest. I strive very hard to live a righteous life because I want to continue to receive God's favor and blessings. I want to be obedient to God and please him. I believe I do pretty good. Thank you Bill and Teddy for your post today.